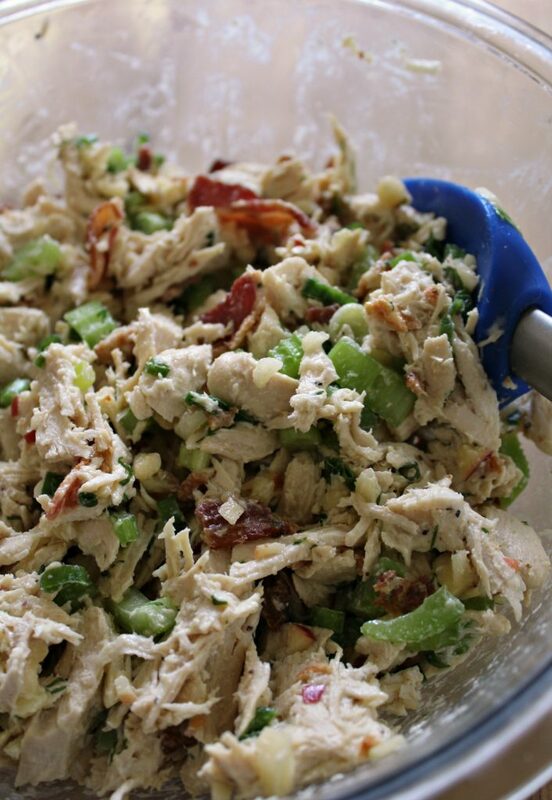 This light and refreshing homemade Chicken Salad with Bacon is loaded with fresh ingredients. It is a perfect lunch to serve in a sandwich, greens or all by itself. You will never make chicken salad any other way after one bite. Lately, I haven’t been able to get enough chicken salad. My favorite being the pre-made version from Costco. If you want to use rotisserie chicken, go ahead. I prefer to boil a few chicken breasts and shred it myself. This way the meat is juicier and doesn’t dry out during baking. 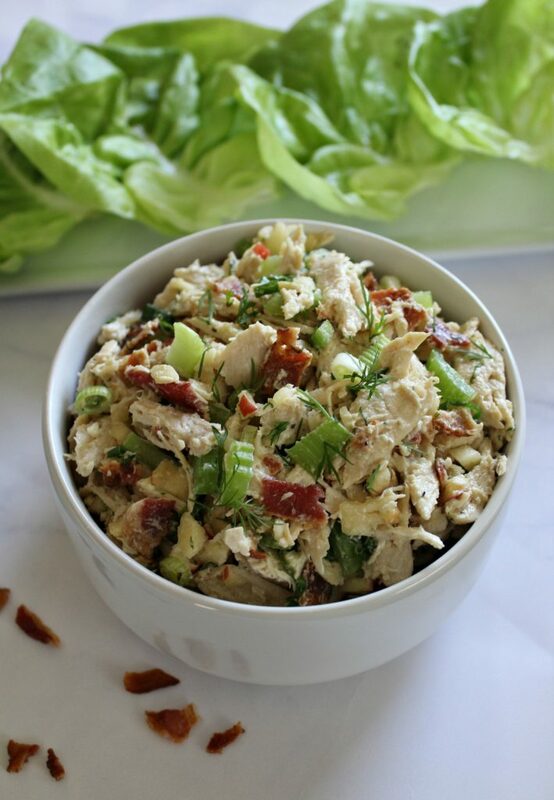 Adding bacon crumbles to the chicken salad is a game changer. 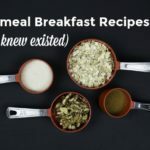 Paired with the finely chopped apple bits, you get a sweet and salty mix in each bite. Not sure why I didn’t think of that before. Most chicken salad recipes call for fruits like grapes or cranberries. However, not many mention using apples. I found that using apples doesn’t overpower the salad in sweetness. It gives the scallions, dill and mustard a fair shot at flavor. 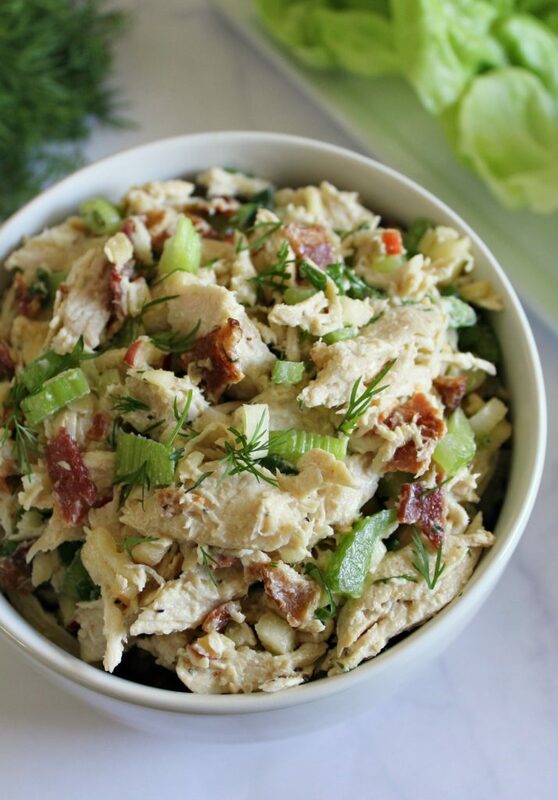 Bottom line – bacon and apples just work in this chicken salad. 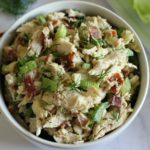 Depending on your dietary preference, this chicken salad can be served over a green salad, in butter lettuce wraps if you want to keep it low carb. If you love lettuce wraps, like I do, check out these chicken lettuce wraps. Also, it’s tasty over toasted bread or simply with a fork on its own. You can’t go wrong either way! Just a side note, you can swap the light mayo for greek yogurt. 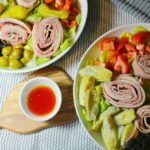 The yogurt gives the salad a slightly different taste, but it won’t take away from the flavor of the overall dish. Now, onto the recipe! 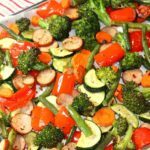 Want more great salad ideas? In a large pot, add chicken breasts. Cover chicken with chicken broth. Add 1 tbsp of minced garlic and pinch of salt and pepper. Bring to a boil, uncovered. Once boiling, cover and reduce heat to low. 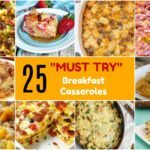 Cook chicken for 25-30 minutes. When meat thermometer reads 165 degrees F, remove chicken and let cool. Shred with two forks and set aside. 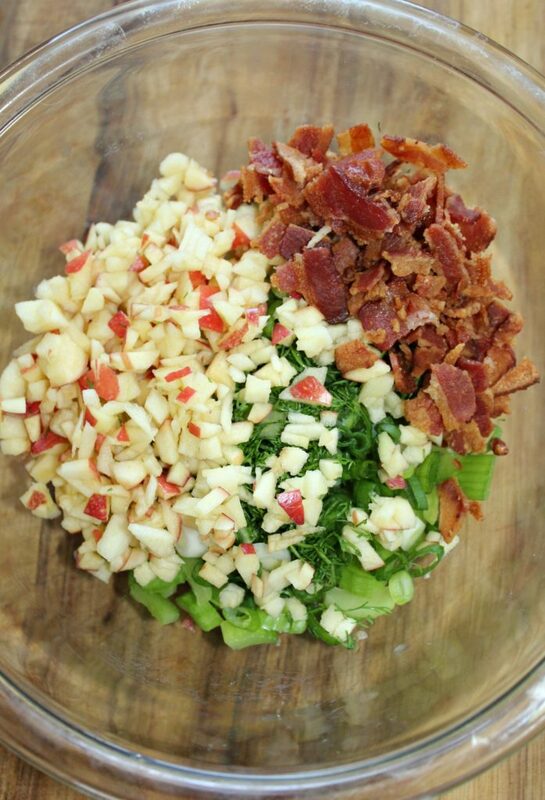 In a small bowl, mix together apple bits, scallions, dill, celery and bacon. In a large bowl, mix together mayo, dijon mustard, pickle juice or lemon juice. Add shredded chicken and stir to coat. Add the ingredients from the small bowl and mix until combined. Cover with plastic wrap and refrigerate for 1 hour. Use within 3-5 days. Enjoy!